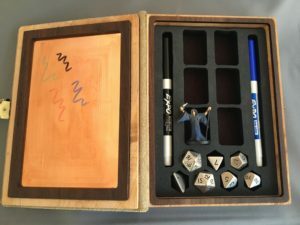 Review : Elderwood Academy Spellbook Game BoxElderwood Academy produces a line of leather-bound, wooden game accessory storage boxes that stormed onto the gaming scene at Gen Con 2016. Elderwood kindly forwarded one of the Spellbooks to me and this is my review. The unboxing surprised me a bit as the Spellbook came in a protective felt bag! It fits the Spellbook quite snugly and folds over in the back. I am likely to keep the bag just to stash the Spellbook in it between games on my bookshelf. 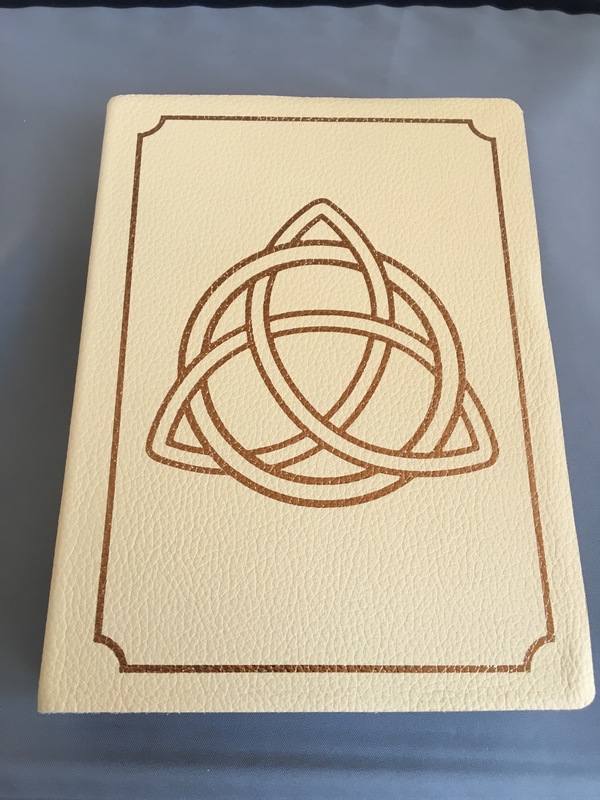 The Spellbook itself is 7.5 inches long by 5.5 inches wide and this particular model is the “extended” size which is 1.25 inches deep. 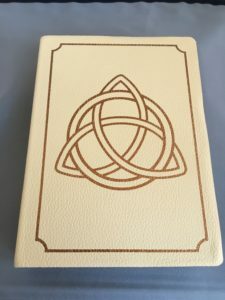 The outer cover is the Ivory leather option with a gold Celtic knot for decoration. 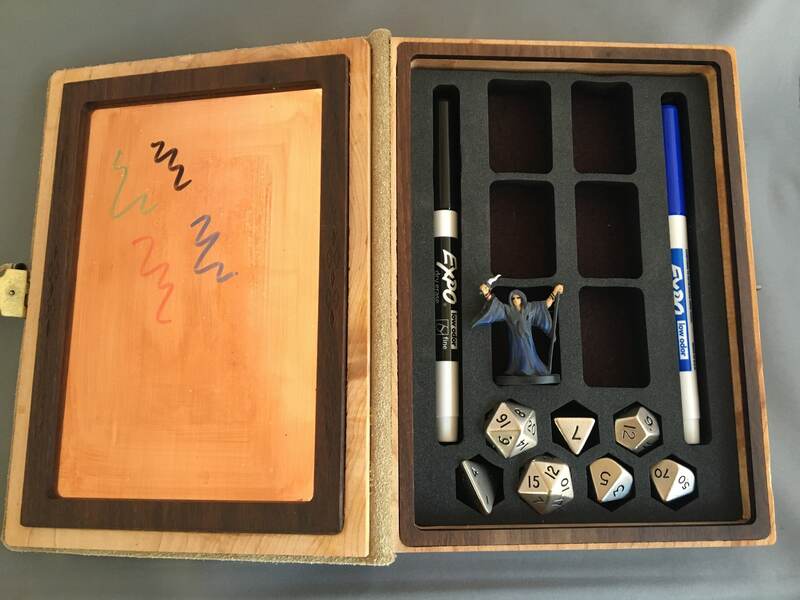 The box is made of Cherry wood with a Walnut interior trim. A antique latch with an integrated hook keeps the box closed when not in use. First, the reflecting pool is not for self-examination, it is Elderwood’s whiteboard solution. I gave it a thorough test at my regular game last night and I had no issue with using it as a whiteboard, in fact it worked better than the whiteboards I use at work. Ink was legible and the surface cleaned up easily with a dry paper towel. There are actually two foam inserts included. One of them is a simple rectangle (not pictured) that covers the reflecting pool and provides a “lid” for the items in the lower part of the Spellbook. I tested it with miniatures, pens and a full set of heavy, metal dice and all stayed in position despite some serious shaking. 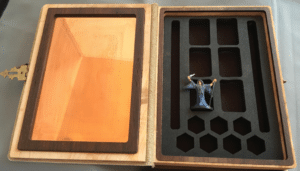 The base foam has space for two pens, six 25 mm miniatures and seven dice. Here is a shot loaded with everything. Also take note of my sample scribbles with the dry erase pens on the left side. All colors were quite visible and contrast was good. Though it is hard to see in this shot, the latch on the lid folds back and provides a “leg” to keep the writing space/reflecting pool flat. 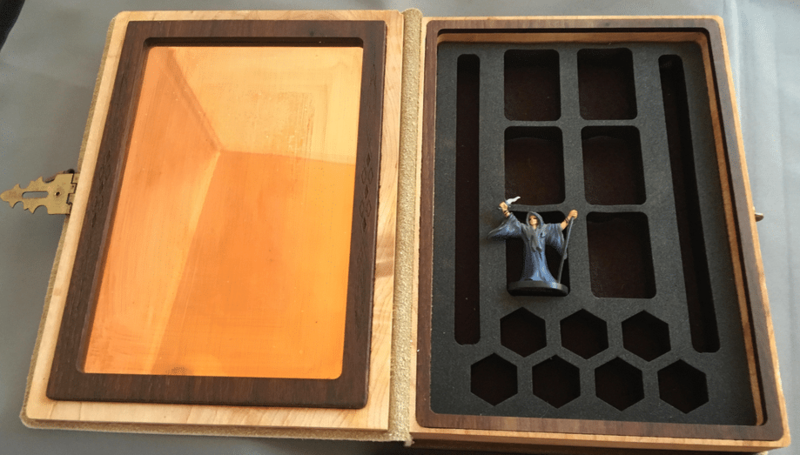 Once you arrive at your game, you can convert the Spellbook to a dice tray. Critical for me because I only use metal dice and many spouses look at me with a dark eye when I approach their unmarred kitchen table. The foam insert comes right out and because it has no back, the dice just fall through into the rolling tray area. The felt interior made for a good rolling surface and the 1 inch high perimeter walls did a good job in stopping dice from escaping. I know some people invest many hours in painting their favorite miniature or buy exotic, expensive dice. For those people the most important feature of the Spellbook is the level of protection it provides. So, in the interests of review completeness, I created my very own stress test for the Spellbook. Do not try this at home. 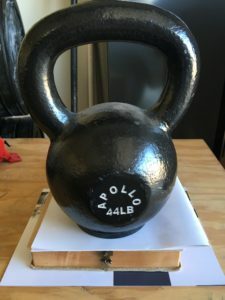 Why 44 pounds? 44 pounds seems like a weight that land on the Spellbook when a laptop lands on it in a backpack or someone briefly sits on it by accident. I did add a few sheets of paper to protect the leather (my kettle bell is cheap and has a rough bottom), but otherwise the Spellbook held 44 pounds (20 kilos) and did not even creak. I was impressed. As a final test, I brought it to my regular game night and here is a shot of the Spellbook in its natural environment. 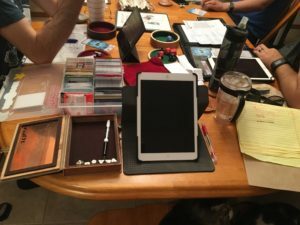 I worked very well as both a note taking device and dice tray while I ran Numenera for my regular group. And it looks amazing on the table! I contacted Elderwood regarding customization options and they indicated that custom designs can be added to the leather for an additional fee. There are many other options for wood, foam styles and leather as well. 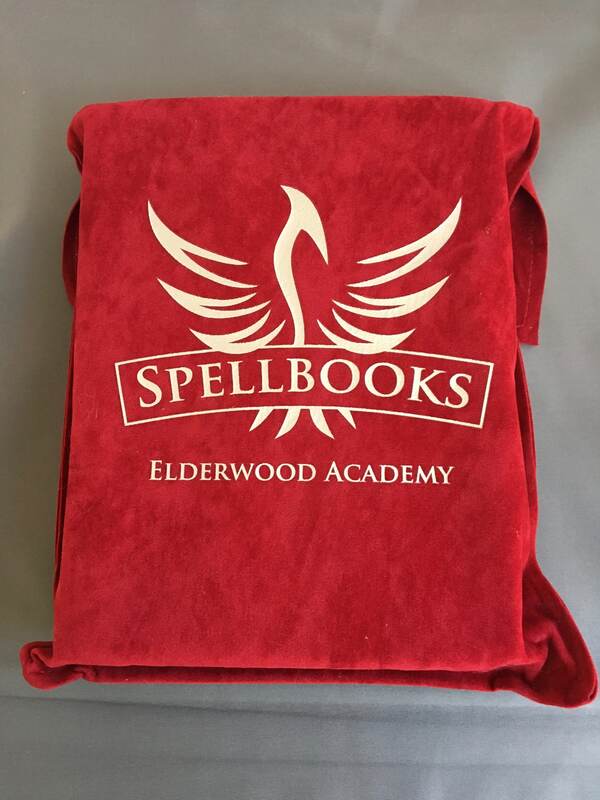 I suggest you check out the Elderwood Academy site for more information. I am deeply impressed the the Elderwood Academy Spellbook and highly recommend it for any gamer. Thulsa Doom, Legendary Conan Villian Gets a Movie Deal! July 22, 2008 trask Comments Off on Thulsa Doom, Legendary Conan Villian Gets a Movie Deal! Crafty Games and Spycraft Seek Volunteers for Gen Con 2013. Swag is Involved. January 28, 2013 trask Comments Off on Crafty Games and Spycraft Seek Volunteers for Gen Con 2013. Swag is Involved. Gaming Paper Is Kickstarting a New Product–8.5 x 11 24 lb Reams of Grid Gaming Paper-Arrived!